In 2016, HRF and the UNDP worked together in the agricultural-based town Dhuluiyah located on the Tigris River to provide urgent assistance to both residents as well as encourage returnees through supporting local food production and markets. Linking livelihood stabilisation and enterprise recovery provides the building blocks in long-term recovery and the building of a strong local economy which is also required to build social cohesion and minimise the impacts of the regional conflict as well as deterring extremism and sectarian-based violence. Dhuluiyah is an agricultural-based town located on the Tigris River. The majority of residents are farmers that farm the irrigated areas either side of the River Tigris. Since July 2014, the town has been on the front line in the conflict between Daesh (Islamic State) and the Government of Iraq. 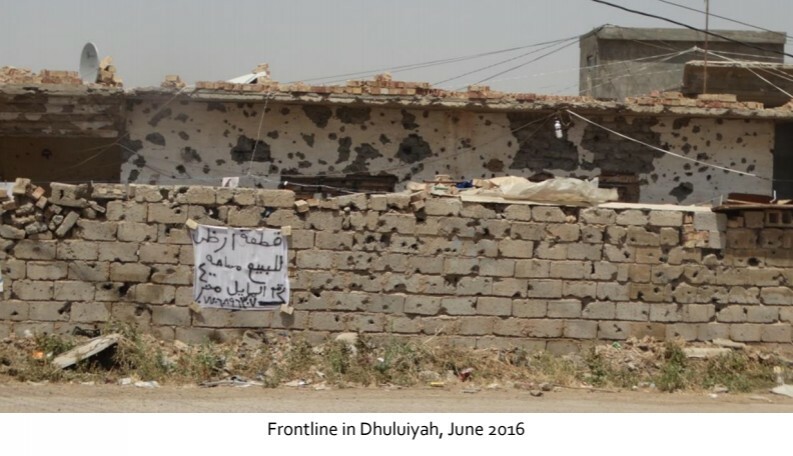 Consequently, the town has a high percentage of war-damage buildings, as well as having five IDP camps located in Dhuluiyah District. From the assessment and the Community Platform the following problems were raised. Impact from the conflict had left the agricultural sector in urgent need of rehabilitation to bring the farm systems back to their full potential. In addition, many of the farm lands were overgrown with weeds and shrubs and farmers no longer have access to suitable equipment, farm inputs (fertilisers/seeds), tools and labour to prepare for the coming season. Whereas in the urban areas there was widespread damage and destruction of institutional buildings which now required repairing, and rubble removal and street cleaning were additional much-needed activities which the local authorities were unable to deliver. The residents of Dhuluiyah District were in urgent need of assistance particularly to encourage returnees by providing an enabling environment that supports local food production with a focus of targeting the most vulnerable families in the District. Together with the UNDP, HRF set out to provide immediate support for current residents and providing incentives for the safe return of displaced families through the rehabilitation of livelihoods in the newly accessible areas of Dhuluiyah. Linking livelihood stabilisation and enterprise recovery provides the building blocks in long-term recovery and the building of a strong local economy which is also required to build social cohesion and minimise the impacts of the regional conflict as well as deterring extremism and sectarian-based violence which has clearly recently been evident in all areas of Salah Al-Din Governorate. As in HRFs previous interventions this project was not just about recovery and rehabilitation but also re-building the community fabric including the social dimensions required for a just and fair society for the future of Iraq. Agricultural lands were prepared and farm inputs were provided to 73 farms. 45 on-farm irrigation pumps were repaired and 1 main network irrigation system was fixed. In addition a total of 21 greenhouses were repaired and replanted. Restocking activities culminated in the provision of 36 cows; 100 poultry farms; 32 fish ponds with 8000 fishlings restocked. Institutional building repairs included rehabilitation of the agricultural warehouse, governorate office and two classrooms. In total 5193 CFW days have been completed over a period of three months, providing financial assistance up to 435 man and 330 females.